I used to think that all old wood furniture had to be refinished: entirely stripped of existing varnish and stain right down to the bare wood. It’s probably not a good idea to take on a full restoration where you’re going to do all this work on a genuine antique. A piece must be at least 100 years old to be considered an antique, otherwise the piece is vintage. I have refinished several pieces over the years and believe me when I say I have learned from my mistakes. It is these mistakes that have made we wiser (hopefully). I recently purchased a 1920s walnut dining room table and chairs and got a quote for restoration of the table. Price? $1600! Um, no thank you. Am I cheap? No, not really but my attitude has always been “Oh, I can do it myself!” And nobody and I mean nobody, is going to tell me otherwise. The table is actually in very good condition. The chairs are another story but lucky for me I am married to a pretty handy guy. His only problem is his attitude! Luckily again, he’s gone from saying things like “Don’t ask for my help. You’re on your own” to “Yeah, I can help with that. I can do that.” Yay me! More on the dining set later as this is going to be a huge undertaking: all chairs need reupholstery and most of the chairs need some sort of repair. It will be months before we even start on this. The walnut sideboard show here is a piece we picked up through a private sale. This piece is HEAVY and I love it. There is something so intriguing to me about bygone eras: the 20s through the 60s. I sold our 1980s dining room (a hand me down from my parents). I never liked the set-oak and boring! I knew I didn’t want another china cabinet. I think they’re useless. Why do people feel they need to “display” their dishes? It’s probably a me thing. I just think it’s weird, so sideboard it is. This gave me a great excuse to go through all my china and glassware and either donate stuff or put some things away for Daughter Restyle. My dishes could live in the 2 side cupboards. Anything that didn’t fit in here, I wasn’t keeping. I wanted to find out more about this. The appraiser believes the drawer pulls may be original. Apparently, they are of the chippendale style but when he looked at the legs more closely, they are a modified chippendale style. Believed to be made in the 1910s-20s. Can’t see it in the pictures but one side was pretty badly roughed up. I really did NOT want to strip and refinish this. I already have several projects on the go right now. Such a shame until I found a product called BRIWAX. I wish I’d known about this years ago. 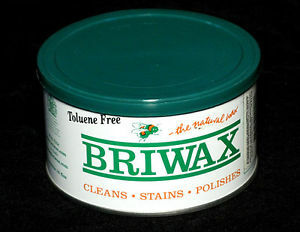 Briwax (pronouned bry wax, not brie wax) is an incredible product. I can’t say enough about it. It can’t be purchased in stores. At least not in Canada. This is a British product made from carnauba and beeswax. I seriously recommend this if you don’t have the time or skills to completely refinish something. In fact, refinishing old pieces like this actually depreciates their value. 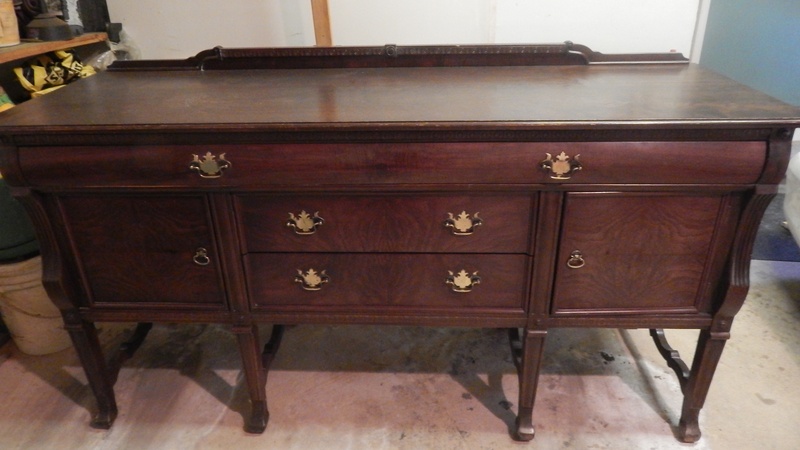 A simple restore may be your best bet if you don’t mind the dings and nicks that come with hundred year old furniture. Briwax comes in different shades. I chose toluene free Briwax in a shade that I thought closely matched the existing finish. A little bit of Briwax goes a long way. Simply apply using a soft cloth, working in small sections and leave it on for about 15 minutes, then buff with a clean cloth to a nice shine. It covers nicks, dings, scratches, etc. quite well. Much better than those stain markers, Briwax cleans the wood as it works. To cover any gouges, small holes, etc. use the wax filler sticks. This product also works wonders. I’ll post the after picture of the sideboard soon and hopefully my 1920s inspired dining room will appear on this blog too! All about the original patina, be gentle, can’t wait to see it finished. With a lovely cut glass decanter or two on the top!